Few names in the history of painting are now as famous as Vincent van Gogh’s, despite the complete neglect he suffered throughout his life. His works, strong and personal, are one of the greatest influences in twentieth century painting, especially in German expressionism. 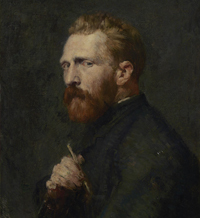 About the artist: Vincent van Gogh (1853 – 1890) was a Dutch Post-Impressionist painter and one of the world’s most famous and influential artists. In just over a decade he created about 2,100 artworks, including around 860 oil paintings, most of them in the last two years of his life. These include landscapes, still lifes, portraits and self-portraits, characterised by vibrant colours and dramatic, expressive brushwork. However, Van Gogh was not commercially successful during his short life, and his suicide at 37 followed years of mental illness, neglected health and poverty. Vincent van Gogh started drawing from an early age. As a young man he worked as an art dealer, often travelling, but became depressed when he was transferred to London. He turned to religion and spent time as a Protestant missionary in southern Belgium. He drifted in ill health and solitude before returning to painting in 1881, having moved back home with his parents. His younger brother Theo supported him both emotionally and financially, allowing him to stay at his Parisian home for some time and keeping in touch by letter. Van Gogh’s early drawings and paintings, mostly still lifes and depictions of peasant labourers, contain few signs of the vivid colour that distinguished his later work. In 1886, he moved to Paris, where he met members of the avant-garde, including Émile Bernard and Paul Gauguin. Van Gogh’s paintings grew bolder and richer in colour as he developed his well-known style seen in art galleries around the world today. During a stay in Arles, southern France, he broadened his subject matter to include series of olive trees, wheat fields and, most famously, sunflowers. Van Gogh suffered from regular psychotic episodes and neglected his health by not eating and drinking heavily. His friendship with Gauguin ended after a confrontation with a razor when, in a rage, he cut off part of his own left ear. He spent much of his later life in psychiatric hospitals, including a period at Saint-Rémy. Sadly, his depression continued and on 27 July 1890, Van Gogh shot himself in the chest with a revolver. He died from his injuries two days later.